Long ago, three bodhisattvas decided to test the character of the animals. They chose the fox, the monkey and the rabbit for their first test. The bodhisattvas disguised themselves as starving beggars, and each asked the fox, the monkey and the rabbit for food. The fox immediately ran off, stole a farmer’s chicken, and presented it to the first beggar. The immortal refused it, saying it was stolen and a poor offering. The monkey scampered into the trees, and came back with two bunches of bananas. The second bodhisattva also refused the offering, because the monkey only did what the beggar himself could do. The poor rabbit, who only ate grass and leaves, knew he had nothing to offer. So, he asked the third immortal to make a cook fire. Once the fire was ready, he threw himself into the flames, saying the men could eat his flesh. But the rabbit was unharmed by the fire. The immortals were so impressed by the rabbit’s generosity, that they let him live forever in the Moon Palace. They honored him further by placing his likeness on the Moon for all the world to see. If you look carefully at the full moon, you can see him, standing next to the pot he uses to make the Elixir of Eternal Life for the immortals. This is very loosely adapted from the Japanese Konjaku Monogatarishū, which is itself adapted from the Buddhist Jataka, or tales of the Buddha, from the 4th century BC. The transmission of the tales came first to China, then Japan, as Buddhism spread north and east from India. The Chinese idea that a rabbit lives on the Moon comes from the Chu Ci 楚辞, Chinese poems of the 3rd century BC — the Warring States period. 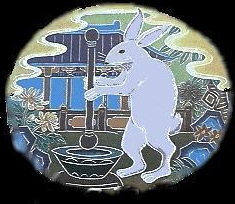 The Han poets imagined that the rabbit 玉兔, who is white like the finest jade, spends his time pounding herbs into the elixir that gives the immortals everlasting life. These stories and the tale of the goddess Chang’E are told to children during the Mid-Autumn (Moon) Festival, which usually falls in late September or early October in the Western calendar. Astronomy topic: Why are days so long on the Moon?